June 20, 2016 – Our Monday, June 20th interview is with award-winning author Neal Bascomb. 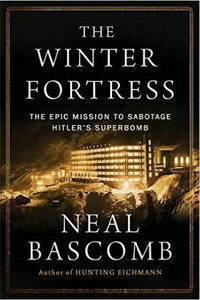 We’re airing our conversation a few days early because his book — The Winter Fortress: The Epic Mission to Sabotage Hitler’s Atomic Bomb — is a perfect gift for Father’s Day. If you think the book might be right for Dad, History Author Show listeners can enjoy a free sample chapter of The Winter Fortress right here. Meet the Norwegian patriots — from schoolteachers to plumbers — who dared defy the Nazis, and endured starvation and harsh winter conditions, to deny Hitler the power to rain nuclear fire on London, New York, and other Allied cities. Our thanks to author Jay Atkinson for pointing The Winter Fortress our way. You can listen to our interview with Jay on his book, Massacre on the Merrimack: Hannah Duston’s Captivity and Revenge in Colonial America .